Yet another Twitter post! 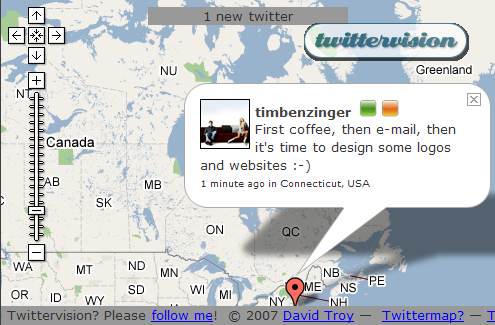 Twittervision is a mashup using Google maps to show aÂ real-time geographic visualization of posts to Twitter. To get your Twitter site listed on Twittervision you simply have to be a member of Twitter with a location and an image defined to appear on the public feed. Pretty simple! Then all you have to do is post.